This home offers 5 bedrooms, all brand new linens included, and 2 Full Bathrooms. You will feel at home from the moment you drive in to this lovely wooded area home. The perfect place to call home for a week-end or week with friends or family. Dew Drop In sleeps 14 Guests. Convenient to Flat Rock Playhouse, downtown Hendersonville, NC. The sleeping quarters: Master Bedroom with Posturepedic King Bed, luxury sheets, spacious Master bath with Jetted Tub, Upstairs Guest Room has King Bed with luxury sheets. Main Floor 3rd Bedroom Full, Main Floor Full Bed and 5th bedroom has Twin Beds.Sleep Sofa in both living room and Den for 4 more guests. Note: 3/2/2019 - ALL new pillows, new towels, brand new carpet throughout. 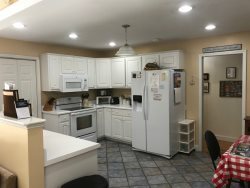 Well Equipped Kitchen has Brand New Refrigerator, Oven/Stove and Microwave,Dishwasher,Coffee Maker . Step outside and walk around the neighborhood, trails by the pond, or relax on the outdoor patio with contained fire pit going on the cooler nights. NC State Theatre; Flat Rock Playhouse . The Biltmore Estate nestled in the Blue Ridge Mountains of Asheville, NC. Explore the 8,000 acres, tour the estate, and visit their winery in Antler Village. The Thomas Wolfe Home Memorial in nearby Asheville draws fans of the American literary giant. In the surrounding mountains, visitors can enjoy a picturesque drive on the Blue Ridge Parkway. Nearby points of interest include the Southern Highland Folk Art Center, the Blue Ridge National Heritage Area, Mount Mitchell State Park, Mount Pisgah, and many other scenic areas. Hiking trails and waterfalls abound in Pisgah National Forest and DuPont State Forest. Recommendations can be provided for a special adventure of rafting, rock climbing or caving. Historic Flat Rock and Historic Downtown Hendersonville both offer a great way to spend a relaxing afternoon with shops and restaurants. Sleep Sofa in both living room and Den for 4 more guests. *some wood provided, some fire wood to purchase at office. Swimming Pool, check on times open at the Center, restricted times open.